Today, on June 26, India is celebrating the victory of Kargil war or Operation Vijay. A war which was thrust upon us by an unscrupulous enemy, who exploited our trust to change the status-quo in an extremely difficult and unforgiving terrain, and required a military-diplomatic might of India to win it. The story of Kargil war is a story of a humble soldier who rose to the occasion and won the battle against all odds. Prime Minister Narendra Modi in a message, paying homage to the soldiers, said, “On Kargil Vijay Diwas, a grateful nation pays homage to all those who served the nation during Operation Vijay. Our brave soldiers ensured that India remains protected and gave a befitting answer to those who tried to vitiate the atmosphere of peace.” Our prime minister is correct, the victory was the achieved through the age-old, time-tested bravery of humble foot soldiers. A lot has been written about the war and lot more will be written in future. There are not many stories left to tell, but no matter how many times the well-known stories of the self-sacrificing acts of brave men are retold, every time they fill us with the same emotion of gratitude towards them. The Union Minister for Defence, Smt. Nirmala Sitharaman along with the Chief of Army Staff, General Bipin Rawat, the Chief of Naval Staff, Admiral Sunil Lanba and the Chief of the Air Staff, Air Chief Marshal B.S. 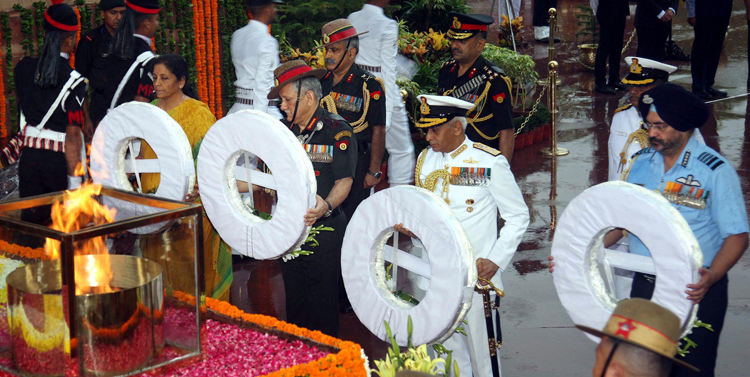 Dhanoa laying wreath at Amar Jawan Jyoti, India Gate, on the occasion of Kargil Vijay Diwas, in New Delhi on July 26, 2018. In the winters of 1998-99, Pakistan crossed across the line of control (LoC) in the Kargil-Dras area of the Northern Ladakh region and occupied the winter-vacated posts of India army overlooking the Srinagar-Leh National highway (NH1). This sector covers approximately 168 km of the LoC from Zoji La in the west to Turtok(Siachen Glaciers) in the east with varying heights between 4,000 to 5,000 metres. This threatened the national integrity as well as the two and a half lakh Indians in Zoji La. The terrain is such that large gaps could not be avoided between the protected areas. Indian army deployed one infantry battalion at Dras, two infantry battalions and a BSF battalion at Kargil. Ladakh Scouts defended Chorbat La. The well-documented misadventure was planned by Gen Pervez Musharraf, then Army Chief of Pakistan later President of Pakistan, was based on a simple premise that India will not be allowed to declare war on Pakistan by the international community as the nuclear tests of 1998 had made both nations nuclear power. The Union Minister for Defence, Smt. Nirmala Sitharaman along with the Chief of Army Staff, General Bipin Rawat, the Chief of Naval Staff, Admiral Sunil Lanba and the Chief of the Air Staff, Air Chief Marshal B.S. 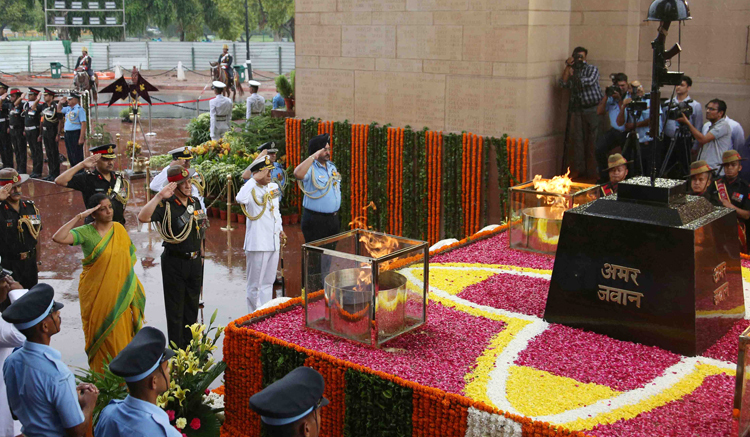 Dhanoa paying homage to the martyrs at Amar Jawan Jyoti, India Gate, on the occasion of Kargil Vijay Diwas, in New Delhi on July 26, 2018. The premise was perfect and the plan on paper was full proof. Playing to the Pakistani script, then Indian Prime Minister Atal Bihari Vajpayee asked Indian army not cross the LoC, thus putting most of the easy routes to occupied heights out of bound to Indian soldiers. And given the challenges that the icy terrain posed to using many of the equipment of Army, the battle was reduced to the soldiers climbing to those peaks through the enemy fire to dislodge the enemy and reclaim the posts which they did proving Pakistan wrong. Everything around the war is a story of limitations from intelligence agencies which failed to know the movement of Pakistani army, their deployment to Indian military planners who failed to foresee possibility of Pakistan doing something of this kind to political leaders who could not fathom courage to go for full-fledged war pushing Pakistan into a situation where it did not have matching conventional capability. One can’t overlook the naivety of Indian nuclear doctrine planners who allowed Pakistan to threaten India with nuclear attack if it crossed the international border in another sector thus lowering the nuclear threshold. Kargil became a war against odds of all kinds. 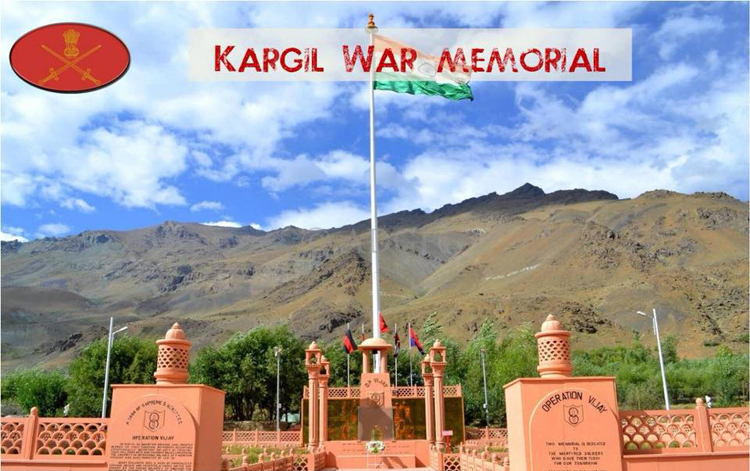 In an era, post Gulf war, when armies began to look at wars being led by military equipment under the protection of the fighters of Air Forces, Kargil was fought in a primitive way by the infantry soldiers with the support of heavy mortars and artillery (wherever possible). It is important to note that India did not have enough ammunition for our artillery guns! This prolonged the war and it took nearly two months, and over 500 dead soldiers and support of Israel’s weapons supply to win the war. Battles to capture Tiger Hill, point 4875, Tololing are some of the famous battles which have become folklore of India and soldiers like Capt Vikram Batra, PVC (Posthumous) of 13 JAK RIF and Lt Manoj Kumar, PVC (Posthumous), of 1/11 GR folk heroes. The war which saw four Param Veer Chakra, ten Maha Veer Chakra and 49 Veer Chakra. To understand the difficulties that Indian soldiers faced, one has to understand the terrain, in addition to challenges coming from terrain like shortness of breath from the rarified air, required acclimatization before moving in the sector to operational challenges like steep climbing and dearth of any natural protection. It is well known that Indian army calculated a ratio of one is to eight to recapture the posts. A very high rate of attrition. But Pakistani were well entrenched behind bunkers on hilltops. The only option left was to climb through machine gun fire from one point to another disregarding the personal safety. But the worst waited for them when they reached on top. Every effort to capture post required closed one to one fight. No post could be captured without physically silencing the enemy machines guns. This brought the best from Indian soldiers. Each post cost India dearly but there was no dearth of brave hearts ready to jump in front of the fortified enemy positions. Nineteen years hence, one can say that when all options betrayed India, it was the men who overcome every challenge to win what was near impossible. Kargil war was the victory or Vijay of the Indian soldier and his grit, determination and valour. Jai Hind.